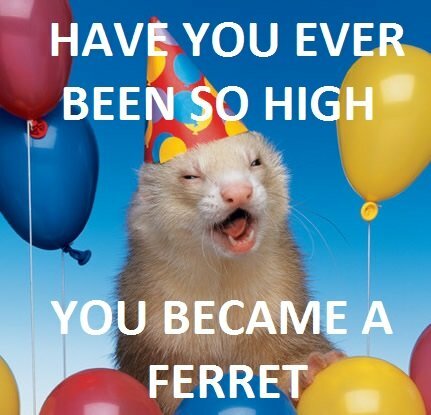 It’s been a rough week and it’s only Tuesday, it’s a week where I have to look at the ferret picture at least once a day. It’s my goto cheer me up picture. I’ve always felt like munchies needed a companion piece. I had intended for it to be set from the beginning, I just don’t always like immediately follow up one idea with the companion. I feel like if you’re following the site and one idea or style doesn’t sit well with your, I shouldn’t force you to sit through a whole month of the same junk. The same sort of run of the same stuff is what pushes me off of Penny Arcade over holidays where. I just don’t care for 3 weeks of cardboard tube ninja. Don’t get me wrong, those guys are the best on the web for a reason and I know you have to do something on vacation. Some time soon I’ll start adding pieces with similar theme and style in combo packs. I’ve been talking about it for a while, but I should encourage pieces like spliffy and munchies to be bought together at a discount.